I've been to Uluru twice now, and both times have been very powerful experiences, but I didn't feel the need to climb it. I would have to say that being there exceeded my expectations - this might seem a bit cliched, but anyone sensitive in any way to the energy of a place will find that Uluru has a very powerful energy. Our group had as a guide one of the traditional owners of Uluru who told us stories of his life, of the importance of the land, and why his people prefer people not to climb. He travelled with us on the journey from Alice Springs, so by the time we arrived at Uluru we felt we knew quite a bit about its significance to the local people. Our group walked around the base of the rock and I know for most of us this was very powerful. To me it is the height of ignorance and rudeness, and in fact a form of racism, for people to climb Uluru despite the wishes of its traditional owners, and I hope that access is restricted in the near future. I don't know that it would make a huge difference to visitor numbers; are there any statistics on how many visitors actually do the climb? How many people climb Uluru, and why. Thanks a lot for your input John! I can't but agree with everything you say. I did some digging to see if there are new numbers regarding the percentage of visitors who climb Uluru. The numbers have been steadily dropping sine 1990, and currently the Aboriginal owners are seriously considering a blanket ban. I found an interesting paper, published in late November, 2007, in Geographical Research. It is called "Constructing the Climb: Visitor Decision-Making at Uluru" by Sarah James. 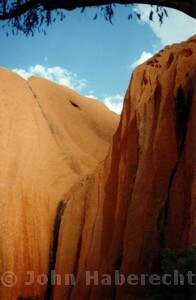 The paper suggests that nearly half of the 400,000 yearly visitors climb Uluru. I have to say, that does not match what I have seen on my own visits. It looked a lot less to me. Europeans show the most respect for Aboriginal culture and are least likely to climb. The climb is heavily promoted in Japan and 80% of Japanese tourists do climb. The main finding in the paper is that visitors are generally open to the wishes of the traditional owners and would forgo the climb, if only they were given enough information and advance notice. Most people interviewed said they were not given enough information about the Anangu's wishes, and that it would have changed their decision if they had been informed earlier. "Many tourists continue to climb as they are given the impression in pre-trip tourism information that it is desirable and acceptable. It is too late to affect their decision by the time they see the 'Please Do Not Climb' sign at the base of Uluru"
The paper also notes that tour operators are becoming more open. They feel the climb is less important to visitors than it used to be and do not expect long term damage to their business if the climb was closed. In other words, if nobody wants to climb it any more, the may close the climb. But probably not if it means tour operators will lose money. To close the climb would have to be a decision by the park's board of management in consultation with the Federal Government. It's not a decision that the Anangu can make on their own, as many people assume. It is true that is very dangerous to climb Uluru. However, I have heard comments saying that Australian government encourage aboriginals to suggest not to climb it. For example, they ask them: -Do you think is very dangerous and that many people could die by climbing Uluru? They ansewer yes. Then they ask again: do you think is better for tourist not to climb because they are risking their lifes? and then they say yes. Then they put like they are the ones suggesting not to climb. I dont know if that is true, but what I have seen is that many tourists come to Uluru to climb it. They want to climb it because is a different experience, is adventure or whatever. This is a tourist attraction which generates a lot of money for Australian economy.. if it is a sacred site, or really important for aboriginal culture, why then they just prohibit the climbing? like they have prohibited the entrance to sacred sites. I think the answer is because it would reduce a visitor atraction and thus, the income. It might be that they say not to climb it but if you climb it is up to you, so they are not responsible for any injurie or death that could happen. I climbed the Uluru and it was basically the most amazing thing that I ever did. I cannot describe how exhilarated and spiritual it felt. This, you have to experience yourself. I also disagreed that it's dangerous to climb. 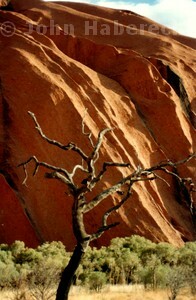 The Uluru is closed to the climb when strong winds actually become dangerous. So when you say it's dangerous because the wind is strong, that's really not quite true. Most deaths that have occurred were due to heart attacks. Now ask yourself, how many heart attacks have happened each year and how many happened, say, in the homes? Does it make living in a home more dangerous? If you are at risk of a heart attack, you shouldn't be climbing the Uluru. Or ride a roller coaster. In terms of actual climbing accidents, the Uluru ranks pretty insignificantly compared to other attractions in the world. You are a lot more likely to die in a car accident, statistically speaking. Scary as hell and LOOKS dangerous? Yes. But actually dangerous? No. All I'm saying is, after I made the climb, I knew without a single shred of doubt that had I not, I would have regretted it very severely. But then I guess if I never climbed it, I wouldn't have known what I missed out on anyway. Oh, for crying in a bloody bucket! I simply cannot believe that in the year 2009, we are still - STILL - having the discussion about whether or not to climb Uluru. For crying in a flaming bucket, haven't the First People of this most precious land lost enough, suffered enough, without having to put up with self-centred tourists climbing this most sacred of sacred sites?! There is no more perfect example of our obsession with possession than the desire to climb Uluru. Go and stand in the embrace of that sacred monolith, and be still for more than a few moments - go on, try - and it will be hard for those subscribers to instant gratification - just try to be still and try hard to appreciate what a privilege it is to stand in the proximity of such a presence. Then, if you must, think about that tired, passe question about whether or not to climb Uluru. If you have one vestige of decency, you will know that Uluru is not for climbing. To look upon and be near it is enough - ENOUGH!! I quite simply have had enough of this argument as well. If the Anangu people prefer for it not to be climbed, then all they have to say is no.....but that would mean loss of income wouldn't it!! No, they can't. They can only do it in conjunction with the governemnt. It would indeed mean loss of income. For the tour operators. That's why the climb will remain open. I am planning a trip to Uluru early next year. While I don't know if I will climb it. I am open to it. I am open to it because I have respect for different cultures in as far as a diversity of ideas and customs that should be preserved across the world. However, I do not feel I should simply adhere to any custom of other cultures "out of respect" for them. Should I abstain from drinking alcohol out of respect for Islam? Should I stop eating shellfish out of respect for Judaism? Should I stop eating beef out of respect for Hinduism? Should we disallow women from playing the didgeridoo out of respect for aboriginal custom? That last one clashes with my own strong belief in equality for women. If we observe one custom, surely we must observe them all. I would be respectful if visiting a mosque, church etc, but this is a purpose-built structure, not a natural landform. In my cultural tradition (anglo-australian) discovery, adventure marvelling in the natural world (including "climbing stuff") is an important tradition. I am planning a trip to Ayers Rock and would like to climb the rock. I am a mountain climber and have climbed in the Himalayas, Alps and Mt. Kilimanjaro. I do believe these mountains are not owned by anybody, but are for all people to be enjoyed and climbed, if they wish. 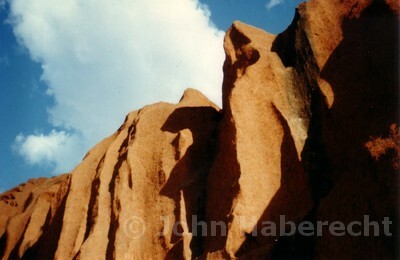 If Ayers Rock wishes to receive visitors then tourists need to be free to climb the 'rock'. People come from all over the world and pay huge amount of money to make the flights to Alice Springs. Should they ever close Ayers Rock to be climbed, they need to advertise this all over the world so travellers dont book their flights and then they are not able to do what they intended to do namely climb the 'rock'. I had several people from Europe visiting and when they visited Ayers Rock, they were not able to climb as the climb was shut. I believe they should have been told before they left Europe, then they could have decided to travel to other destinations within Australia. That's exactly the point. A lot of money is earned by a lot of people as long as the climb remains open. The Anangu on their own can not override the decision by the government and white people. That the climb remain open was a condition before the land was, given back to them. Symbolically, one might say, since they can not do anything without consent of the government. And because WHITE people earn money from this, a lot of money, the climb will remain open. There are geological features that are privatly owned, all over Australia. I appears if white people own say a spectacular gorge, then it's ok to close it to the public, or charge entry and then only allow you to enter parts of it. This happens all over the country. But for Uluru it's not ok? And you seriously think it's sensible to demand that the National Park people predict at least two weeks in advance whether it will be too hot or windy to climb on any given day? So that no tourists end up disappointed after spending money on a flight? How about climbing Kilimanjaro and not reaching the summit due to bad weather? Shame on the national park people there for not letting climbers know before they booked. In response to Wyn's comment, I sure would abstain from drinking alcohol while I am visiting an Islamic country. In fact, I did, and I also observed their dress code, Ramadan, and other aspects of their culture while I was visiting. It's the minimum respect I would show any host, be it a Western host I visit in his or her house in my own country, a foreign country or Aboriginal land. Nobody asks that we stop climbing any and all rocks. We are only asked to respect the owners wishes while visiting their land. No more and no less. Thank you Anangu boy for your comment - says it all really. I've been watching the comments here with interest, or should I say astonishment at many of them - the sense of entitlement that some people have about an area that has deep spiritual and ceremonial significance for its traditional owners. We are guests when we visit, and should respect their wishes. It is not for us to dictate the terms. And as for notifying intending travellers ALL OVER THE WORLD that Uluru is not going to be open for climbing because of heat or other conditions ... did that person think about that statement before they wrote it I wonder! Well its all good and well to huff and puff over the internet like true bloggers, but once you've taken those grand strides to reach the peek of this massive rock, then my ignorant friend you can tell me its not not just a big rock that benefits our otherwise bland tourist attractions. One thing the English can hang there hat on, is knowing just the way to turn up to a party uninvited. So honestly, measuring previous performance would you seriously consider that we drop democracy for an impressive rock. Sorry buddy, but the revenue that baby pumps out, helps to pay your welfare, and your kids public school education. you should not climb uluru. this mountain is part of someones heritage and we should respect it just as we would our own. It's simple. A very polite request you do not Ularu. A request from it's traditional owners who have inhabited Australia for over 50,000 years? How hard is it to respect their beliefs. It must break their hearts to see what is happening. I've never been. But I don't think I could, as I couldn't watch other tourists and just say nothing, at the total lack of respect they are showing to our indigenous people who are suffering as a result. With the tourist attraction comes the higher prices of food, fuel, clothes....How must these original land owners struggle. They don't profit from the climb. They pay for it everyday! It is so sad, that some humans cannot leave anything or place untouched. It's selfish, greedy and disrespectful to climb the rock. No way around it. Accept that you are these 3 things, then go ahead and climb! Don't bother pulling the ignorance card. If you go, you go fully aware. I'm curious that nobody else has made this point. I'm British, now living in the Netherlands and am having a month's holiday in Australia in October (probably the only time that I will visit the continent in my life). I thought long and hard about visiting Uluru because it is a popular tourist destination, and the presence of other people imapcts on the experience. I have decided to visit, but I would have been *more* likely to choose to visit if climbing had been banned. For me, seeing tourists climbing over the rock (I've seen a video) makes the place *less* special, and *less* attractive as a destination. I wonder how many other people feel that way? So true, i have been to Uluru several times and it never gets old. It is one of the best places that i have ever been to. But sadly the last time i went there, there was a whole group of tourists climbing one the indeginous Australians most sacred place. Wyn, Poor excuse for an ignorant person. No one is telling you to stop drinking in a western country or to stop eating shellfish on a day to day basis, but in a specific Muslim country for example it would be respectful not to drink. As other comments above have stated, they complied with dress codes not in their own country...but when they traveled there. Reconciliation.org has a bit of information so you can understand the actual reasons why it is disrespectful. I hope people realise one day that closed minded, disrespectful behaviour will not get them anywhere. I don't know how people sleep at night knowing they are disrespectful, ignorant and closed minded. Don't climb the rock. Please. I do not understand why people are making a huge deal about the disrespect of indigenous culture due to climbing the rock! If you have ever lived in a remote, predominantly black community, as I do - you will notice that a few people climbing on a rock is not ruining the culture - it is the alcohol, drugs, younger generation, crime & road side beggars that are ruining the culture!! People climbing the rock is generating tourism, revenue & the few people who are ACTUALLY still traditional - money in the pocket: but then again, its the half castes kicking up the storm - because all they care about is the $$$ - which trust me THEY GET!!! But if people don't climb it, how long will the culture last anyway? A large majority of the "Anangu" are the ones ruining the culture with means explain prior, not a few tourists on a large rock!!! Go ahead, climb it. It won't ruin the culture in France if you climb the Eiffel tower, nor the Chinese if you do the great wall!! The definition of maturity is doing the right thing without being forced to to the right thing. To say you're going to climb because no one has placed a ban on climbing is narrow-minded, immature, and selfish. Have you been to Alice Springs when the bottle shops open? As a family, we visited the Northern Territory last year. It was one of our most memorable, beautiful and exciting trips in the five years we have been camping around Australia. "Before" we left, we had decided that it would be a lesson in respect for the Aboriginal culture & people to not climb Uluru. We had planned this trip to educate our four children about the aboriginal dream time, their culture and the people. We found the older generation were wonderful, genuine and inspiring. But, the begging, drinking, violence and neglect that the younger generation has was confronting, sad and threw our education process of "respect" out the window! Seeing large numbers of both the young and old cramped into a cars of twelve people or more to go to the bottle shops, sitting in the dirt alongside the road, drinking in the park, begging in the car parks and the streets, calling you foul names and throwing garbage at you when you refused to give them money was extremely confronting. Not to mention their loud swearing, jeering and generally disgraceful behaviour in Alice Springs after 5pm, well that just topped it off! To see a community imprisoned in their own homes after 6pm at night is abhorrent to say the least. We then decided, as part of our educational process and fourth generation Australian heritage to climb Ayers Rock (Uluru). To teach the boys respect and appreciation of their culture of times past (not their current behaviour) and to wonder at God's creation. We loved the experience of Ayers Rock, my feeling and emotions when seeing Ayers Rock for the first time are only equalled by that of the Taj Mahal! Thanks for the great resource on outback Australia and on Uluru specifically. As I have been researching I have definitely been interested in what opinions are in whether to climb Uluru or not, before we make up our own minds. As kiwis, we are used to the idea of some areas being "tapu" or sacred and we have always respected those. While I would love to climb Uluru and make the most of opportunity, I think that respecting the area is far more important. I am looking forward to exploring the outback area and enjoying Uluru from the ground. "To me it is the height of ignorance and rudeness, and in fact a form of racism, for people to climb Uluru"
Perhaps it also might seem that it is as you put it ignorance and rudeness and in fact a form of racism to hold their hand out for the money that they get from the lease they singned just five minutes after getting it back it back to the very same people that took it away from them in the first place. They signed the lease KNOWING that it would be open for climbing therefore it is a height of ignorance to hold their hand out for the money then ask for it not to be climbed. I was at Uluru and had no idea you could climb it . They said , please don't climb it when I was there but I did In precise 43 minutes up to the top and down to base . I'm a trail runner with lots of hill training . I do have great respect of all cultures and religion , and have lived all over the world . The fact is, we are all living on this planet and no one owns anything . I'm from Germany btw. That rock has a positive energy all around it . It makes you feel you want to hug it . Like it's your mother . I say climb it , and be one with nature and the elements and respectfull . Yes, I completely agree with that. You are correct when you stated that it is not up to the Anangu people to close the climb. When the land was given back to the traditional owners through Sir Ninian Stephens the Anangu people they in turn just five minutes later leased the land back to the Australian Government KNOWING that it was to be open to climbing ,although subject to certain criteria. The Anangu people can close the climb it one of their elders passes away. As such, the climb will be closed for a week. (Do not quote me on the exact days) Other reasons for the closure is for weather etc. I climbed the rock (and not ashamed of it either) and it was calm at the bottom. However, after an hour at the top it get very windy and all left and headed back down again. When we got to the bottom the wind was very light. I do not have much faith in the paper that you refer to Birgit. This was created nearly 7 years ago. When my son and I climbed it last year most of the people in the car park climbed it. I can say this as I was at the end of the chain section and sat and had a look over the car park and surrounding areas. I can say that MOST people getting out of their cars climbed or attempted to climb the rock. Some did not make it very far. When I returned to the bottom and heard that some were upset upon it being closed for high wind. They could not believe it was dangerous up there. I saw numerous people of ALL nationalities including European speaking people get out of their cars walk up to the gates and instead of walking around the rock they got back in their cars and drove off. I agree that the walk around was great as well. However, I will never forget the climb and no one will ever make me feel guilty we did. Anyone who climbed Uluru has no respect for culture and religion, climbing Uluru is like shouting in a church while mass is on. There were sacred ceremonies held there before the tourists came, and now they had to move them because of the tourists. They can't shut it down without providing an alternate activity, which means lots and lots of the money that they don't have currently. All those people who were saying that its okay because they aren't shutting it down because they are greedy and want money and horrible people. They would love to shut it down but they can't. Do not climb this sacred place. I did climb Uluru with all my four children. I am a Australian by four generations, a christian and respect the views of others. I do not regret climbing and I will certainly return to allow our youngest the opportunity as they missed out last time, being as they were too young. To say to climb is like shouting at church, is ridiculous. The climb is legal, it is the climber's choice and is permitted by the original owners. We all are given a freedom of choice, as such it is the choice of each and every individual to climb ..... or not to climb. Read the sign, understand the rock is sacred (yet climbing is permitted), respect nature and the earth we live in. Make your own decision.